One of my Dad's nightly ritual was a family prayer. It was something that he insisted that we be a part of, every time we were together. He used to lead us in prayer, and would start with thanking the Lord for a wonderful day that we've had. He would pray for the sick, the suffering, women in labor, the widowed and the destitute, the orphaned and the disadvantaged. One of the scriptures that he'd quote and would stay within me was from Psalm 23: 2-5. David uses a lot of imagery in his psalms and the one in Psalm 23 comforts, soothes and reassures. In today's rat race, chances are there will be moments when you'd wish you lived in simpler times. Christians have for long believed in their Savior as sheep in its shepherd. Peppered throughout the Bible, Christ talks about how He loves and cares for His people as a shepherd would for his sheep. Of how the shepherd would recognize and call his sheep by name. Now, as a person born and bred in a city, I could only visualize this bond between the sheep and their shepherd. Then, I got to see a shepherd with a herd of his sheep during a recent visit to a village. I saw how the sheep would follow every command of their master, safe in the assurance that absolutely no harm would come their way. Even when in unknown fields. Though illiterate, he knew the needs of his sheep from dawn to dusk and beyond. Now I am no animal psychologist but for an animal known to be timid, the mere presence of their shepherd made all the difference. Spiritually timid, we are wired to seek the calm reassurance of our Creator- Jesus Christ. 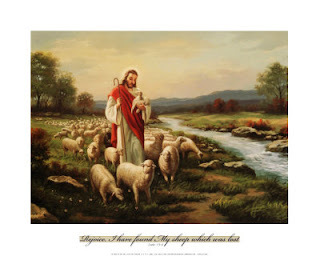 From atheists to orthodox, He is the only Shepherd who can lead us by name to the calm waters of life. In our solitary moments during the day, as we find our lives too heavy and the pressure to excel too harsh, all we really need to do is look to our Shepherd. He knows just the gentle brook that we need.